Why Do You Build Me Up? Caroline is looking like one fast Easter egg. After a healthy spread of filling compound on Friday, the fellas had their work cut out for them on Monday. The corn crib was a whirlwind of dust and shavings as the hull was attacked with sanding boards and jointer planes. After rounds of each it was time to clean her off and look at her again and see what humps and bumps needed to come out next. 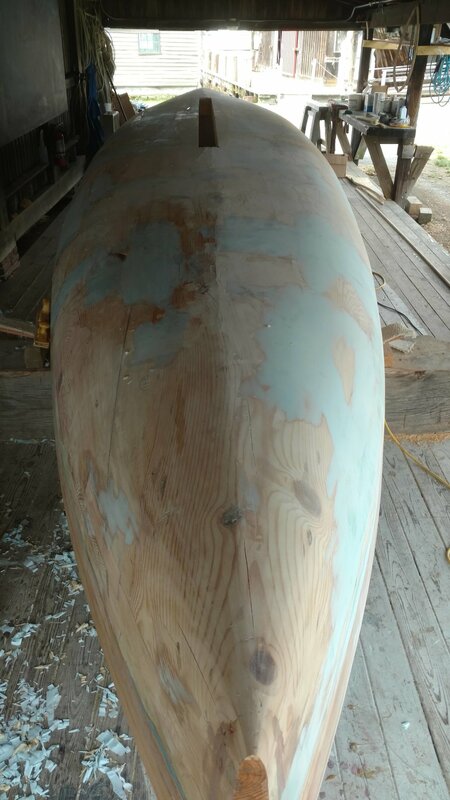 Using a long batten, we marked out high and low spots along the hull before applying a second round of filler. Yesterday was spent milling the mahogany that will be used for the outer skin along the topside planking, but today we were back to fairing. Without the entire shipyard with a sanding board in their hands, it’s not quite as quick a job, but with a little more sanding and fairing tomorrow we will be close to our final surface.